The Selmer Presence is part of a new range from Selmer under the Seles range. Designed for the most popular price points the new Seles range re-invigorates the Selmer offerings to these busy areas of the marketplace. 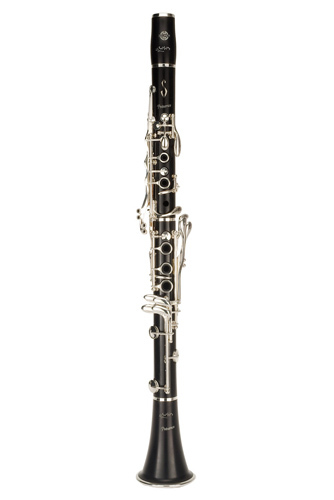 The new Presence clarinet is Selmers first truly fresh clarinet design for quite some years. There has been a great deal of research and design behind each and every manufacturing process and decision. Positioning and sizing of tone holes, the shape of the internal bore and the layout of the keywork has all been analyzed, adapted and modified to represent a new chapter in the Selmer clarinet story. The Presence offers a balanced, even and wonderfully rich tone across it's whole range. The lower register in particular is extremely warm and broad in sound and the tuning across the instrument is superb. Entering a busy area of the market the Presence will be judged against the popular Buffet R13 and RC and alongside the increasingly succesful Yamaha custom series. Teachers and players alike are now spoilt for choice at this price point, only time will tell which models come out on top...it's great to see Selmer now also have a serious contender in the mix. Specially selected Grenadilla wood, naturally treated, lacquered and waterproofed for a protection and finish at the top of its class. The Presence is fitted with Valentino pads that offer a long lasting durable and water resistant finish. Supplied in smart Presence case with Selmer C85 120 ebonite mouthpiece.